I love me some Jane. See Jane Work always puts a smile on my face. I could blog about Jane every single day... I can't resist paper products, and for those of you that can't either, check out all of the new treats from See Jane Work for Back to School. 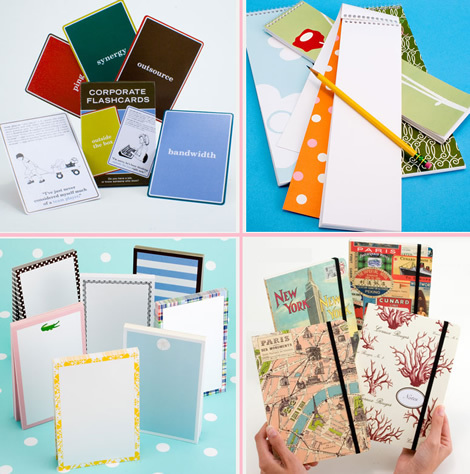 I think what makes Jane stand out from the rest is presentation - from the easy breezy website to the beautiful crystal clear product shots, you just crave posh office supplies the moment you step inside her online paper emporium. Another perk of shopping with Jane? She wraps your wares in blue tissue paper. Try that at Staples. Some of my favorites are the Corporate Flashcardswith words like synergy and bandwidth for $11.95 (I must buy these for my close pal Lana, whom I left behind in the corporate world), Jill Smith Notepads $7.50, super slim, super chic (wouldn't we love to be described like that! ), very preppy sweet Boatman Geller Notepads $11.25, and Cavallini Printed Notebooks $12.95 (I own Cavallini folders, great quality). I carry notebooks like this in my handbag, good for tucking away receipts and for sketching a quick idea that you may see in a store.